Being based in Brighton meant that it was easier for us to travel up to Bedford the night before and stay in a Premier Inn close by. This enabled us to wake up feeling fresh, enjoy breakfast and make our way to the 9.45am session. The centre was nicely sign-posted, and there was lots of private parking for customers. Located next to the car park was a wooden chalet where we were welcomed by a friendly face, and given stickers with our falconer’s name on. We were then guided to ‘Maggie’s Tea Room’, where we had a complimentary hot beverage – much needed on this chilly Wednesday! Willow and I never seem to be very lucky with the weather when it comes to outdoor experiences, but the wind wasn’t going to dampen our mood, and neither was the potential rain! 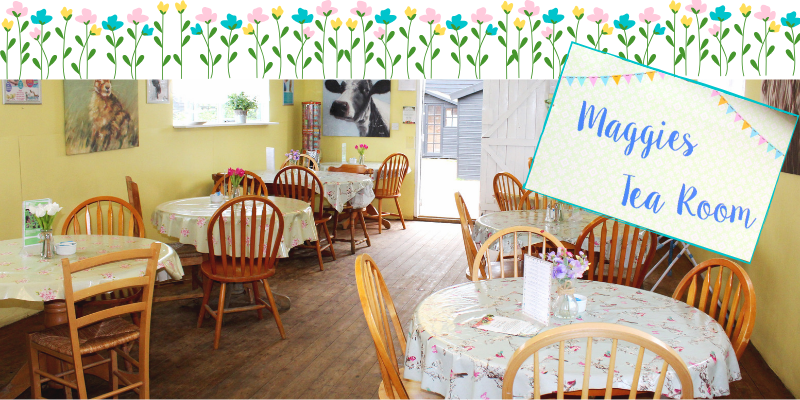 The tea room had beautifully laid tables, and a large cake selection. We happily waited for our group and leader Ria to arrive. Ria had been working at the centre since she was 13, when she would volunteer at weekends. Her passion for birds of prey was clear to see, and she loved telling us about her first bird bought for her by her Dad. Once our group had gathered, we walked over to the owl enclosures, and couldn’t stop admiring their beauty. Ria collected 4 birds, which we all took turns holding. There was Simba, a tawny owl who was the cutest little bird I have ever seen! He was so relaxed and almost falling asleep whilst sitting on our arms. Then there was Tilly, a Malaysian brown wood owl. She was a lot larger, and I could only hold her for 5 minutes before my arm started to ache! Enzo the kestrel was petite and content in our company, and Ronan the lanner falcon was very inquisitive about our cameras. 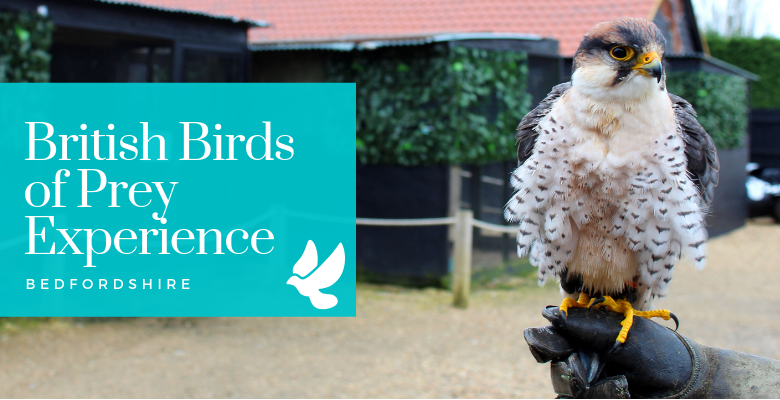 We were informed that birds of prey do not like to be stroked as it puts oil on their coats, which makes them less waterproof against the rain. So, as much as I wanted to stroke little Simba, I restrained myself! We learnt lots of interesting facts throughout the day, including the fact that only 20% of owls are nocturnal, despite the myth that they all are. After we all held our new feathered friends, they were returned to their homes. This was because it was time to fly some of Britain’s most magnificent birds! We eagerly walked over to the arena, ready to learn. First up was Trigger, a gorgeous barn owl who was going to be 1 in April. 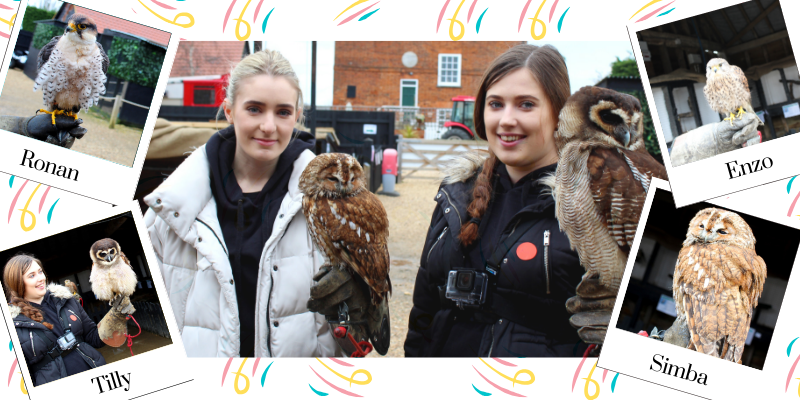 Only 70% of barn owls live up to their first birthday, but in the care of The English School of Falconry, Trigger was definitely going to beat those odds. A thick bird handling glove was placed on my left arm, the traditional arm used by falconers. Ria sneakily passed me some food, and as soon as I held my arm out straight Trigger swooped towards me to enjoy some grub. Watching Trigger so elegantly soar through the air and gently land on my arm was incredible, and a memorable moment from the day. We went on to fly a Harris hawk, who was also not yet 1. Ria explained that the colouring of the hawk highlights if it is a baby. Both the barn owl and hawk were very intelligent, and realised if they repeatedly flew away there would be more food waiting on the falconer’s glove on their return. The last bird we flew was an eagle owl named Earl, whose wing span was so huge that when he flew towards Willow, she was brushed in the face by feathers. Very amusing to watch. As the 2-hour experience came to an end, Ria invited us to walk around the venue and see the other animals. The alpacas were off on a walk with some smiling guests, whilst the donkeys relaxed in their enclosure. The centre was well looked after and so were the animals. We couldn’t help but look around the gift shop before we left. 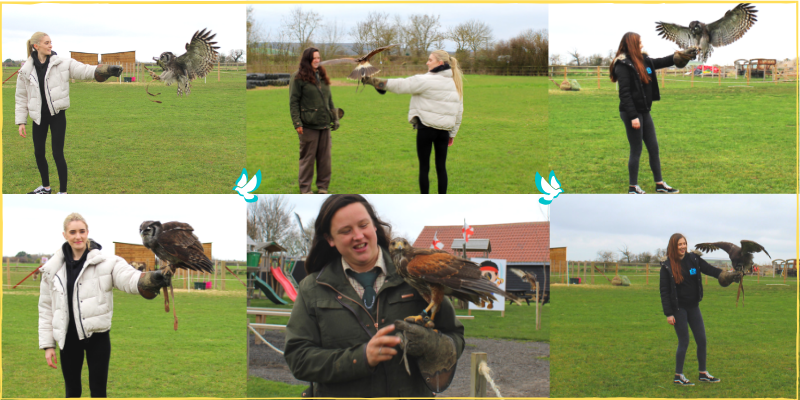 Thank you to Emma and The English School of Falconry for having us, and Ria for making the experience fun and informative. We had a great time!